I have mentioned before that in February I will be seeing the Canadian Opera Company’s production of Wagner’s Tristan und Isolde. It is one of those operas that has been on my short-list for quite a few years, and I am thrilled to finally have the opportunity to see it. It opened this week, and I am pleased to see that the production is being praised in lavish terms (also here). Hurrah! I think this is going to be great. This is not a politics blog, but after what I wrote yesterday about this week’s sad anniversaries, I want to follow up by commenting on a story that has broken just today: three Canadian Members of Parliament have asked our national police commissioner to investigate documented cases of infants who were apparently born alive during an abortion procedure and subsequently died. The MPs contend that these cases may meet the legal standard for homicide. …the MPs say abortions performed at 20 weeks gestation or later breach Section 223a of the Criminal Code. From 2000 to 2009 in Canada, there were 491 abortions, of 20 weeks gestation and greater, that resulted in live births. This means that the aborted child died after it was born… According to the Criminal Code, a child is considered to be a human being and a person after proceeding fully from the mother’s womb, therefore, based on Section 223(2) of the Criminal Code, there should be 491 homicide investigations or prosecutions in connection with these deaths. As I say, this is, at best, incompetent journalism. The MPs are not asking that all abortions performed after 20 weeks gestation be investigated as possible homicides, as the article states, but only those cases in which the child is first born alive and then allowed to die. I don’t think there is a clear moral difference between the two cases, but there is a difference under the Canadian Criminal Code, according to which birth magically confers “human being”-ness upon the child, thereby making the child a potential victim of homicide. Was any medical care offered to these young human beings? Of course it might be that some were not yet at the point of viability and so nothing could have been done to save their young lives (apart from preventing the abortion attempt in the first place), but some of them may have been viable. (With current technology in North America viability is about 50% at 24 weeks gestation.) Certainly it is hard to argue that such cases, grisly as they are, should not at least be investigated to discover the facts. It might be that the cases do not, according to the various fictions governing this section of our Criminal Code, constitute legal homicide, but wouldn’t you like to know for sure? The Toronto Star, in a piece by Tonda MacCharles, gets the story right. Update: the CBC have now improved their story to reflect the fact that the letter is about infants born alive. That is a big improvement. However the television segment, accessible through the same page, presents the story as being about all abortions after 20 weeks gestation. Given that the reporter is on camera waving the letter and still doesn’t bother to state the facts clearly begins to look less like incompetence and more like fudging. I don’t actually expect much better from the CBC, but I would have been happy to be wrong. This week marked two major anniversaries in the political struggle for legal protection for the unborn in North America: the twenty-fifth anniversary of R v. Morgantaler, which struck down all abortion laws in Canada, and the fortieth anniversary of Roe v. Wade, which effectively did the same in the United States. This is not a subject that I enjoy writing about; the terrain has been covered so many times, over and over, that it hardly seems worth the effort to try again. The pro-life side has the moral high ground and the stronger arguments, but the pro-choice side has the power and the status quo, and, especially in Canada, nothing seems to budge one way or the other. Sometimes I feel like I am living in Louisiana in 1840. Today, then, I will simply draw attention to some of the more noteworthy commentary that I have seen on this issue in recent days. Before doing so, however, I would like to briefly comment on the media coverage of these anniversaries. The media coverage has been, putting it as kindly as I can, incompetent. Many pro-lifers have complained, for instance, year after year, that the mainstream media ignores the annual March for Life in Washington, DC. This year was no exception: hundreds of thousands marched, and most of the major US news outlets ignored it. Search Google News for “March for Life” and you’ll come up with articles from the National Catholic Reporter, Lifesite, the Nashua Telegraph, the Greene County Daily World, and other heavy hitters. The New York Times’ coverage was both minimal and biased (critiqued here), and the story filed by the AP was riddled with errors both factual and grammatical (fisked here). As has been noted, the day after the March for Life approximately one thousand people marched in favour of gun control, and the media was all over them. The disparity speaks for itself. If you want to see what actually happened at the March for Life, try YouTube. In Canada the coverage of our anniversary was similar. The Canadian Press ran an article about how Canadians “don’t want to reopen the abortion debate”, a refrain heard so commonly up here that I wouldn’t be surprised if someone (probably from Quebec) would propose putting it into our national anthem. ([Snip: removed parenthetical comment.]) The National Post, our allegedly conservative national paper, seems not to have run a single article or column about the anniversary. The Toronto Star, our reliably left-wing daily, ran one column, by the odious Heather Mallick, celebrating Henry Morgantaler, Canada’s most prominent abortion activist. The CBC, our state-owned national broadcaster, reported that some barriers to abortion in Canada have yet to fall: namely, in Saskatchewan women seeking an abortion must make two separate visits to their doctor, rather than just one. And the flagship CBC radio news program ran a segment in which they interviewed Henry Morgantaler’s lawyer and an abortion clinic founder. How is that for fair and balanced? (Although it is nice to see the Morgantaler decision described as merely “historical” rather than lauded as “historic”, a subtle but significant difference that I am sure could not possibly be a mistake). All told, it amounts to a shameful lack of moral seriousness about the most important human rights issue of our time. In “The Paradox of Persons Forty Years after Roe”, Gerard Bradley of Notre Dame Law School examines the way in which the debate about abortion addresses the foundations of our legal order. It’s an illuminating essay. In “Bringing Marx into the Abortion Debate” Russell Nieli looks to an unlikely source for pro-life arguments. Couched in a reminiscence of an abortion debate at Princeton, Nieli emphasizes Marx’s insight into the ways in which material interests can distort our moral judgements, which is surely a significant factor underlying this issue. In a review of Christine Overall’s book Why Have Children? The Ethical Debate, University of Pennsylvania law professor Amy L. Wax draws attention to the way in which liberal abortion laws undermine the rationale for child support laws. It is an obvious point, but one we do not hear very often. We shall not weary, we shall not rest, until every unborn child is protected in law and welcomed in life. We shall not weary, we shall not rest, until all the elderly who have run life’s course are protected against despair and abandonment, protected by the rule of law and the bonds of love. We shall not weary, we shall not rest, until every young woman is given the help she needs to recognize the problem of pregnancy as the gift of life. We shall not weary, we shall not rest, as we stand guard at the entrance gates and the exit gates of life, and at every step along way of life, bearing witness in word and deed to the dignity of the human person — of every human person. Here’s an interesting fragment of cultural history: Gramophone magazine has dug up a “symposium” which they originally published in 1926 wherein they polled leading figures in British society about their favourite songs, singers, composers, and so forth. Among the respondents are Hilaire Belloc, G.K. Chesterton, D.H. Lawrence, John Galsworthy, Noël Coward, Walter de la Mare, W. Somerset Maughan, G.B. Shaw (sort of), and Max Beerbohm — those are just the names I recognize. The responses are what they are, but I cannot help wondering what sort of responses would be given to a parallel poll today. Even taking into consideration that it is Gramophone magazine asking the questions, I expect that we would see a much greater emphasis on popular music and much less familiarity with anything written more than fifty years ago. Actually, we don’t have to speculate. Casting about a bit I discover that a number of politicians have announced their favourite songs: Barack Obama and John McCain, for instance, or here is a long list including Bill Clinton, Bill O’Reilly, Mitt Romney, John Kerry, and so forth. It is pop music across the board. These folks are all American; maybe things would be different elsewhere, and maybe we shouldn’t expect much from politicians. Here is a list of movie stars, singers, and politicians naming their favourite songs; aside from a few jazz standards and one classical piece (Tony Blair likes “Ave Maria”, although we are not told which setting), they are all pop songs. If we ask specifically about favourite composers, not much comes up; Quentin Tarantino likes Ennio Morricone, so that’s something. This is a cardinal point in the doctrine of Thomas Aquinas. To posit substance as the proper receiver of existence (proprium susceptivum ejus quod est esse) is not to posit it as a “container” into which existence has but to flow in order to make it be. So long as there is no existence, there is no receptacle to receive it. Existence is here fulfilling an entirely different function. As we have already described it, the substance is “that which” exists, and it is quod est in virtue of its form. Form then is ultimate act in the order of substantiality. In other words, there is no form of the form. Consequently, should we have to ascribe “to be” or “is” to a form, it could not be considered as a form of that form. No point could be more clearly stated than is this one in the metaphysics of Thomas Aquinas. My emphases. Maybe I am just not getting enough sleep these days, but I’ll give a special prize to anyone who can state this a little more clearly. In the meantime, here is something edifying: my friend Adam Hincks, S.J. 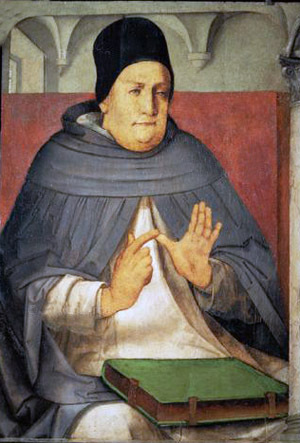 has posted a short reflection on the principal lessons he learned from a recent course he took on Thomistic metaphysics: What I Learned from St. Thomas Aquinas. I’ve just learned that a new television series based on Chesterton’s Father Brown stories has been made by the BBC. The ten episodes of the first (only?) season have aired over the past two weeks. I am not a huge enthusiast for the Father Brown stories, but I’ll probably make an effort to see a bit of this. Episodes can apparently (I haven’t tried it) be viewed online for another week or so. Does it seem odd to anyone else that all ten episodes have aired in the space of just a couple of weeks? Is that a normal thing in the UK? Here in the colonies episodes would normally air on a weekly basis. Anyway, if anyone has seen the programme and cares to offer an opinion, I’d be interested to hear it. All of this reminds me that I forgot to post something at The Hebdomadal Chesterton this week. I’d best head over there now. Fidelio was Beethoven’s only opera, which was understandable given the trouble he took over it. He laboured, off and on, for over a decade, and in the end three different versions were published. Today it is usually the last of these that is performed. In an art form in which love affairs are so often paired with jealousy, lust, murder, and all the other outsized elements of grand opera, Fidelio is a notable exception for being a drama in praise of faithful married love. Beethoven, for all his musical innovations and his emblematic role as Enlightenment hero, was no moral revolutionary. Florestan languishes in prison for exposing the corruption of a local authority, and his wife Leonora, disguised as a man and answering to the name “Fidelio”, is trying to gain access to the prison to comfort him. Strange to say, not much happens in the opera’s two-hour span: Leonora eventually does get into the prison just as a threat against Florestan’s life is coming to a head; the one prevents the other, and the couple are reunited and live happily ever after. Act II opens with what is probably the most famous aria in the opera. For the first time — already half-way through the opera — we see and hear Florestan, confined in his prison cell. He sings a long lament, Gott! Welch Dunkel hier! (God! What darkness here!) It’s a moving few minutes. Here is Ben Heppner; again, I am unable to stop this video at the end of the aria, but it comes to an end somewhere around 1:24:30. Finally, near the end of the opera there is another lovely quartet in which the various principals reflect on what has happened: Florestan freed, reunited with Leonora, and justice done. It is a pool of quietness before the rousing closing number. It ends at about 1:56:30. During the Dickens bicentennial year, I made a resolution to read at least a few of his novels and to tackle Peter Ackroyd’s doorstop of a biography, which had been sitting on my shelf for several years. As it turned out, I managed to read only one novel (Martin Chuzzlewit), but I did succeed in finishing not only Ackroyd’s biography, but Chesterton’s as well. Here I am, a few weeks late, to say a few [sic] words about them. Dickens rose to greatness from humble beginnings. Born into a downwardly-mobile middle-class family, he was embarrassed as a young boy when his father had debt troubles and was confined for a time to the Marshalsea prison. Dickens was himself forced to take employment in a blacking factory to help with the family finances, a circumstance which occasioned such deep shame that he concealed it his entire life from all but his closest friends; we may speculate that his special concern for the happiness of the poor was rooted in these experiences of labour and poverty. But, these episodes aside, his childhood was in many respects a happy one: he wandered the streets of London — that city which he was to make his own in such an extraordinary way — exploring the thoroughfares and byways, watching the people come and go with a facility and sensitivity for detail that astonished his friends throughout his life. “Dickens had, if ever man had, the key of the street,” says Chesterton, “His stars were the lamps of the street; his hero was the man in the street.” City streets were, in a sense, his home; his stories are not those of drawing rooms and manor houses, but of alleys, sidewalks, and bridges, and the bustle of London’s streets was always a comfort and an inspiration to him. The track of the story wandered; the tone of the story changed; a servant whom Pickwick found cleaning boots in an inn-yard took the centre of the stage and towered even over Pickwick; Pickwick from being a pompous buffoon became a generous and venerable old English gentleman; and the world still followed that incredible transformation-scene and wishes there were more of it to this day. This was the emergence of Dickens into literature. The Pickwick Papers brought him fame throughout England. Both Ackroyd and Chesterton comment on the remarkable range of his popularity: his stories were relished by high-society connoisseurs and by the poor labouring classes, even those who were illiterate. An early biographer noted that “I found [a locksmith] reading Pickwick. . .to an audience of twenty persons, literally, men, women, and children.” Chesterton argues that the special appeal of Dickens to the poor was rooted in his comic vision of ordinary life (“He was to make men feel that this dull middle class was actually a kind of Elfland.”) and that his broad popularity is evidence for the deep vein of truth his fiction touches (“In everybody there is a certain thing that loves babies, that fears death, that likes sunlight: that thing enjoys Dickens.”) I was interested to learn that for many years, long after he had unquestionably become the most famous and successful author in England, Dickens was worried by the thought that his inspiration would desert him and that he would fall from the public’s graces back into a life of poverty. It is true that the size of his readership fluctuated from book to book during his lifetime, but he was always popular, and — though of course he could not have known this — for a long time after his death each successive edition of his books sold better than the one before. I don’t believe that any of his books has ever been out of print. He did much more than write novels too. I was surprised to learn that throughout his life he took on side projects, ranging from writing and performing in amateur theatrical productions (which was always an intense passion of his) to editing journals and newspapers. In the beginning his intention was to maintain a safety net for himself should his literary fortunes fade, but he continued with side projects long after they ceased to be financially necessary. It is fair to say that he was, in modern parlance, a “workaholic”: he was unable to sit still or relax for long, and was most content, after a fashion, when burdened with large amounts of work. Since work is a curse, I cannot help seeing this as a character defect, and indeed it is one of the few things I do not like about the man. “. . . From these garish lights I vanish now for ever more, with a heartfelt, grateful, respectful, and affectionate farewell.” There was a brief hush in the audience followed by something very like a common sigh and then, as his son recalled, “a storm of cheering as I have never seen equalled in my life”. His head was bowed and the tears were streaming down his face as he left the platform. What sort of a man was Dickens? Those who knew him in society routinely noted his vivacity, his verbal quickness, and his restless manner. He often dressed flamboyantly, in loud colours, with something of the air of a dandy. People often noted his astonishing powers of observation, his seeming capacity to take in a scene in remarkable detail, and to assess character with a facility that sometimes unnerved acquaintances. Henry James, after meeting Dickens, highlighted this aspect of his personality, while also (characteristically) seeing deeper into it than most; he noted “. . .a straight inscrutability, a merciless military eye, I might have pronounced it, an automatic hardness, in fine, which at once indicated to me, and in the most interesting way in the world, a kind of economy of apprehension. . .” He loved social occasions, and the theatre, and the busy streets of the city; “a long walk in the noisy streets would act upon him like a tonic”. He was a very disciplined man, in his way. Certainly he was a disciplined writer: he would customarily write each day from 9 am – 2 pm, “like clockwork”. He sat at his desk looking out of a window, and he averaged about 2000 words each day. When writing he would sometimes leave his chair and stand before a mirror, observing himself as he acted out the dialogue he intended to write, trying out facial expressions and tones of voice. He was, in fact, a very visual writer, who placed great stress on the illustrations accompanying his stories and often looked to them for inspiration. While working he required absolute silence in the house, which was something of a burden to his family. He stressed the value of punctuality and order to his servants. He filled his house with mirrors, and almost always wanted a window left open. Everything must be put right, and put right at once, with him. If London bored him, he must go to the Continent at once; if the Continent bored him, he must come back to London at once. If the day was too noisy, the whole household must be quiet; if night was too quiet, the whole household must wake up. Above all, he had the supreme character of the domestic despot — that his good temper was, if possible, more despotic than his bad temper. When he was miserable (as he often was, poor fellow), they only had to listen to his railings. When he was happy they had to listen to his novels. He would not abide criticism of himself, and would go to great lengths to defend himself against even frivolous charges, both at home and in society. On such occasions, notes Chesterton, “even in being on the right side he was in the wrong place”, for he wasted a great deal of energy to little purpose. He cannot have been easy to live with, and his inability to consider that he might be wrong, coupled with his impulsiveness and apparent lack of concern for the impact of his whims on the lives of others, was surely a factor in the eventual failure of his marriage. We are left with the impression of a man so carried away by his own energies that he often ran rough-shod, wittingly or not, over the lives of his family and friends. Occasionally his letters reveal glimpses of more pedestrian aspects of his life and personality that nonetheless round out our picture of him: Ackroyd writes of “How he liked to bathe in cold water in the mornings; how he read The Times every day; how he never wore a nightcap; how he carried a Gladstone bag with him on his travels; how he autographed his bottles of wine; how he was a good carpenter and “handy man”; how he hated to be called “Sir”; how his favourite colour was light orange; how he preferred cold, bright weather; how he had a mania for opening windows to the fresh air; how he kept his own books neatly in a row, in the order of their publication; how he wrote out instructions to the various servants about their various duties; how he loved candle-light; how the flag was hoisted above the house when he was in residence.” I don’t know that I have ever heard of anyone else for whom orange was a favourite colour. Great barrels of ink have been spilled over Dickens’ religious views, and controversy remains. One camp maintains that he was basically a faithful, if largely dispassionate, member of the Church of England; in their defence they can cite The Life of Our Lord, a narrative of the New Testament which Dickens wrote for his children, Dickens’ own avowal that “All my strongest illustrations are derived from the New Testament; all my social abuses are shown as departures from its spirit”, and his reference, in private correspondence, to “the truth and beauty of the Christian religion”. He is known to have prayed every morning and evening. Others argue that his Christianity was nominal, diffuse, and un-doctrinal, and that he lacked any particularly strong religious commitment beyond “generalized benevolence”. He is on record as rejecting the “hard doctrines” of original sin and last judgement. In his novels, clergyman are never attractive figures, and churches are not attractive places (apart from an occasional dose of the picturesque). As one would expect, both parties are on to something. Ackroyd writes that he “seems to possess a religious sensibility without any religious beliefs”, and Chesterton complains that he had “that dislike of defined dogmas, which really means a preference for unexamined dogmas”. He did, however, believe in Providence (and was therefore not a Deist) and good works, and he said that he saw the role of the novelist as reflecting that of God within the confines of the story, arranging things for the best. He disliked Catholics (and Anglo-Catholics) and Dissenters, and (we may safely surmise) anyone who took religion more seriously than him. Not for him any understanding of the terrible consolations of the faith, nor of the history that supported its elaborate framework of worship. He was so out of sympathy with the Catholic Church that he saw only its surface. He saw its comedy. In this regard, at least, he had no real cultural or theoretical sensibility; he saw only the illusions and idiocies of the present, not the presence of the past. Still, I cannot help but wonder what might have happened if that seed had fallen in more fertile soil. We shall never know! I was going to say a few words about Dickens’ relationships with women, which is another of the subjects that rends the body politic and generates great fortunes for makers of ink, but frankly it doesn’t interest me enough. Dickens was a mythologist rather than a novelist; he was the last of the mythologists, and perhaps the greatest. He did not always manage to make his characters men, but he always managed, at the least, to make them gods. They are creatures like Punch or Father Christmas. They live statically, in a perpetual summer of being themselves. It was not the aim of Dickens to show the effect of time and circumstance upon a character; it was not even his aim to show the effect of a character on time and circumstance. . . Once the great characters are face to face, the ladder by which they climbed is forgotten and falls down, the structure of the story drops to pieces, the plot is abandoned; the other characters deserted at every kind of crisis; the whole crowded thoroughfare of the tale is blocked by two or three talkers, who take their immortal ease as if they were already in Paradise. For they do not exist for the story; the story exists for them; and they know it. Those who have any doubt about Dickens can have no doubt of the superiority of the later books. Beyond question they have less of what annoys us in Dickens. But do not, if you are in the company of any ardent adorers of Dickens (as I hope for your sake you are), do not insist too urgently and exclusively on the splendour of Dickens’s last works, or they will discover that you do not like him. Prior to reading Chesterton’s book, I would have counted myself among those who prefer his later books. I suppose that I still do, but I am now less confident in that judgement. I need to revisit the early books, especially The Pickwick Papers, with Chesterton’s argument in mind. Dickens has greatly suffered with the critics precisely through this stunning simplicity in his best work. The critic is called upon to describe his sensations while enjoying Mantalini and Micawber, and he can no more describe them than he can describe a blow in the face. Thus Dickens, in this self-conscious, analytical and descriptive age, loses both ways. He is doubly unfitted for the best modern criticism. His bad work is below that criticism. His good work is above it. Did I say that I was closing? Yes, but I’d first like to back away from Dickens himself to say a few quick words about the two books which have occasioned this post. Ackroyd’s biography is a treasure-trove. He says at some point that during his research he had written out an index card for each day of Dickens’ life, and it shows: the level of detail is meticulous. He evades being tedious by the excellence of his writing and the thoughtfulness and affection that he brings to his subject; I can honestly say that I was never bored. In another place he remarks that in preparation for writing the book he read all of Dickens’ published work — both novels and correspondence — at least three times, not to mention reading the secondary literature listed in the bibliography (which runs to about 400 titles)! The book is a major accomplishment, which for any author could justly be considered the crown to a life’s work. That Ackroyd has also written over fifty (!) other books is all the more amazing. Interleaved with the biographical material are several imaginative fantasies: Dickens meeting his own characters in the streets of London, Dickens in conversation with Ackroyd, Ackroyd interviewing himself about his book, and so on. All of them are great fun. In the self-interview, Ackroyd asks himself, “Why did you decide to write the book in the first place?”, to which he replies, “I don’t know. It just seemed like a good idea at the time.” I love it. I have already sung the praises of Chesterton’s book, but I can remember the tune: I could say that it is unquestionably among his finest literary criticism, which is true, but I would fail to convey just how insightful and delightful it is. Ackroyd says in his book that Chesterton is “perhaps Dickens’ best critic,” and it is easy to believe. As evidence, I will close with a string of quotations from the book that I was unable to work into the text of this post. Happy reading. We talk of the power of drawing people out; and that is the nearest parallel to the power of Dickens. He drew reels and reels of highly coloured caricature out of an ordinary person, as dazzlingly as a conjurer draws reels and reels of highly coloured paper out of an ordinary hat. But if anybody thinks the conjuring-trick is easy to perform, let him try it with the next ordinary person he sees. The exaggeration is always the logical extension of something that really exists; but genius appears, first in seeing that it exists, and second in seeing that it will bear to be thus exaggerated. That is something totally different from giving a man a long nose; it is the delicate surgical separation or extension of a living nerve. It is carrying a ludicrous train of thought further than the actual thinker carries it; but it requires a little thinking. It is making fools more gloriously foolish than they can be in this vale of tears; and it is not every fool who can do it. Those who see in Dickens’s unchanging characters and recurring catch-words a mere stiffness and lack of living movement miss the point and nature of his work. His tradition is another tradition altogether; his aim is another aim altogether to those of the modern novelists who trace the alchemy of experience and the autumn tints of character. He is there, like the common people of all ages, to make deities; he is there, as I have said, to exaggerate life in the direction of life. The spirit he at bottom celebrates is that of two friends drinking wine together and talking through the night. But for him they are two deathless friends talking through an endless night and pouring wine from an inexhaustible bottle. That original violent vision of all things which he had seen from his boyhood began to be mixed with other men’s milder visions and with the light of common day. He began to understand and practise other than his own mad merits; began to have some movement towards the merits of other writers, towards the mixed emotion of Thackeray, or the solidity of George Eliot. And this must be said for the process; that the fierce wine of Dickens could endure some dilution. On the whole, perhaps, his primal personalism was all the better when surging against some saner restraints. . . For my own part, for reasons which I shall afterwards mention, I am in real doubt about the advantage of this realistic education of Dickens. I am not sure that it made his books better; but I am sure it made them less bad. He made fewer mistakes undoubtedly; he succeeded in eliminating much of the mere rant or cant of his first books; he threw away much of the old padding, all the more annoying, perhaps, in a literary sense, because he did not mean it for padding, but for essential eloquence. But he did not produce anything actually better than Mr. Chuckster. But then there is nothing better than Mr. Chuckster. Certain works of art, such as the Venus of Milo, exhaust our aspiration. Upon the whole this may, perhaps, be safely said of the transition. Those who have any doubt about Dickens can have no doubt of the superiority of the later books. Beyond question they have less of what annoys us in Dickens. But do not, if you are in the company of any ardent adorers of Dickens (as I hope for your sake you are), do not insist too urgently and exclusively on the splendour of Dickens’s last works, or they will discover that you do not like him. It is evident, in short, why even those who admire exaggeration do not admire Dickens. He is exaggerating the wrong thing. They know what it is to feel a sadness so strange and deep that only impossible characters can express it: they do not know what it is to feel a joy so vital and violent that only impossible characters can express that. They know that the soul can be so sad as to dream naturally of the blue faces of the corpses of Baudelaire: they do not know that the soul can be so cheerful as to dream naturally of the blue face of Major Bagstock. They know that there is a point of depression at which one believes in Tintagiles: they do not know that there is a point of exhilaration at which one believes in Mr. Wegg. To them the impossibilities of Dickens seem much more impossible than they really are, because they are already attuned to the opposite impossibilities of Maeterlinck. His literary genius consisted in a contradictory capacity at once to entertain and to deride — very ridiculous ideas. If he is a buffoon, he is laughing at buffoonery. His books were in some ways the wildest on the face of the world. Rabelais did not introduce into Paphlagonia or the Kingdom of the Coqcigrues satiric figures more frantic and misshapen than Dickens made to walk about the Strand and Lincoln’s Inn. But for all that, you come, in the core of him, on a sudden quietude and good sense. Such, I think, was the core of Rabelais, such were all the far-stretching and violent satirists. This is a point essential to Dickens, though very little comprehended in our current tone of thought. Dickens was an immoderate jester, but a moderate thinker. He was an immoderate jester because he was a moderate thinker. What we moderns call the wildness of his imagination was actually created by what we moderns call the tameness of his thought. I mean that he felt the full insanity of all extreme tendencies, because he was himself so sane; he felt eccentricities, because he was in the centre. We are always, in these days, asking our violent prophets to write violent satires; but violent prophets can never possibly write violent satires. In order to write satire like that of Rabelais — satire that juggles with the stars and kicks the world about like a football — it is necessary to be one’s self temperate, and even mild. A modern man like Nietzsche, a modern man like Gorky, a modern man like d’Annunzio, could not possibly write real and riotous satire. They are themselves too much on the borderlands. They could not be a success as caricaturists, for they are already a great success as caricatures. The chief fountain in Dickens of what I have called cheerfulness, and some prefer to call optimism, is something deeper than a verbal philosophy. It is, after all, an incomparable hunger and pleasure for the vitality and the variety, for the infinite eccentricity of existence. And this word “eccentricity” brings us, perhaps, nearer to the matter than any other. It is, perhaps, the strongest mark of the divinity of man that he talks of this world as “a strange world,” though he has seen no other. We feel that all there is is eccentric, though we do not know what is the centre. This sentiment of the grotesqueness of the universe ran through Dickens’s brain and body like the mad blood of the elves. He saw all his streets in fantastic perspectives, he saw all his cockney villas as top heavy and wild, he saw every man’s nose twice as big as it was, and very man’s eyes like saucers. And this was the basis of his gaiety — the only real basis of any philosophical gaiety. This world is not to be justified as it is justified by the mechanical optimists; it is not to be justified as the best of all possible worlds. Its merit is not that it is orderly and explicable; its merit is that it is wild and utterly unexplained. Its merit is precisely that none of us could have conceived such a thing, that we should have rejected the bare idea of it as miracle and unreason. It is the best of all impossible worlds. The hour of absinthe is over. We shall not be much further troubled with the little artists who found Dickens too sane for their sorrows and too clean for their delights. But we have a long way to travel before we get back to what Dickens meant: and the passage is along a rambling English road, a twisting road such as Mr. Pickwick travelled. But this at least is part of what he meant; that comradeship and serious joy are not interludes in our travel; but that rather our travels are interludes in comradeship and joy, which through God shall endure for ever. The inn does not point to the road; the road points to the inn. And all roads point at last to an ultimate inn, where we shall meet Dickens and all his characters: and when we drink again it shall be from the great flagons in the tavern at the end of the world. Brown, one of the world’s bestselling authors, will publish his fifth novel on 14 May, his publishers announced this morning. Langdon, a Harvard professor of “symbology” who sports a “charcoal turtleneck, Harris Tweed jacket, khakis, and collegiate cordovan loafers”, will be adventuring through the “heart of Europe” this time round, where he will be “drawn into a harrowing world centred on one of history’s most enduring and mysterious literary masterpieces”. This ought to be good. And just what is the masterpiece that has had the misfortune to attract Mr. Brown’s attention? None other than Dante’s Inferno. It is a canny (though, naturally, unhappy) choice: Inferno has an imposing reputation and a certain allure, though relatively few people have actually read it. Thus Mr. Brown gets them in the door, after which he can pretty much do what he wants. And I’ve no doubt he will, on both counts. It is a hard thing to see a beloved book disfigured by a nincompoop, and quite a few mean-spirited witticisms occur to me. I am going to resist. It is probably too much to hope that the book will be a flop, so I content myself with this: I hope this is not the first volume in a trilogy. Today some fascinating music from a relatively little-known source: Clement Janequin probably wrote this chanson to celebrate the victory of the French over the Swiss at the Battle of Marignan in 1515 — not that any of us know or much care about that battle. The reason to hear it is not the battle, but the music! If you think all Renaissance music is solemn and stately in the Palestrina manner, you’re in for a surprise. La guerre is here given a spectacular live performance by The King’s Singers. It takes about two minutes to really warm up, so if you do decide to listen don’t abandon it too soon.